We’re going to bet you’ve not seen that statement made anywhere else if you’re following the discussions surrounding Louisiana’s supposed “fiscal cliff.” This doesn’t change the fact that it’s the truth. The Louisiana legislature, and the Republicans in charge of the House specifically, don’t have to cut Louisiana’s budget and in all likelihood won’t be doing so. Why? Because the budget has already been cut. Louisiana is required by law to have a balanced budget, and accordingly in late January Gov. John Bel Edwards and Commissioner of Administration Jay Dardenne sent up a state budget which was, in their estimation, in accordance with state law. In other words, it was a balanced budget. Edwards and Dardenne both excoriated their own budget document and trashed it as some sort of doomsday scenario, but it was a balanced budget. We said so at the time. Since that budget was released, there have been a number of developments indicating that the billion-dollar budget deficit Edwards said the state was facing – which was his justification for calling the abject wasteful failure of a special session last month, because if he didn’t get his billion dollars’ worth of tax increases Louisiana would collapse into the Gulf of Mexico, don’t you know – was vastly oversold, to put it charitably. The two most obvious ones are that first, the state is going to collect some $302 million in increased state income taxes due to the effects of the federal tax reform bill passed by Congress. Also, since oil has been trading at $10-12 per barrel higher than the $51 at which the Revenue Estimating Conference pegged it, that’s another $40 million or more in revenue the state can expect to reel in. 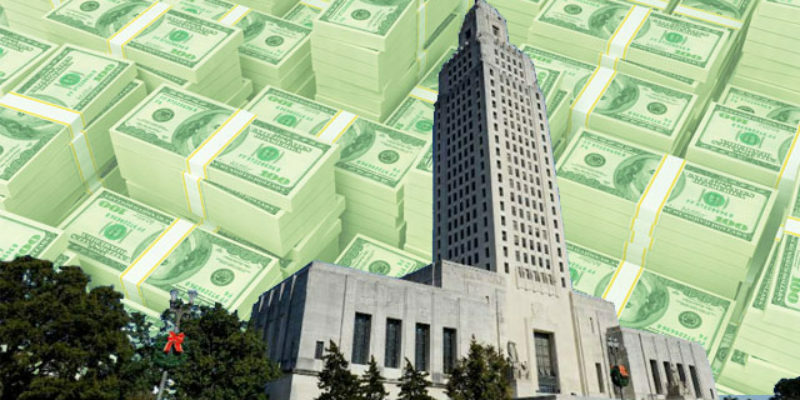 Which means that if the state legislature were to just pass Edwards’ budget as proposed with no changes, Louisiana would run something close to a $350 million surplus just with those two factors taken into consideration. Got that? There are non-recurring items in the state budget which have been added to the “fiscal cliff” calculation and can be paid for with money laying around so as to make the necessity for tax increases less pronounced. That’s what Harris is saying – you can, if you’re interested in actually solving the budget problem rather than maximizing it for political effect so as to emphasize a “crisis” necessitating a tax increase, reduce the deficit by $152 million by using one-time money to pay one-time expenses. The counter to this is going to be “Oh, that’s what Bobby Jindal did,” which brings up an entirely different discussion which was never honestly presented. 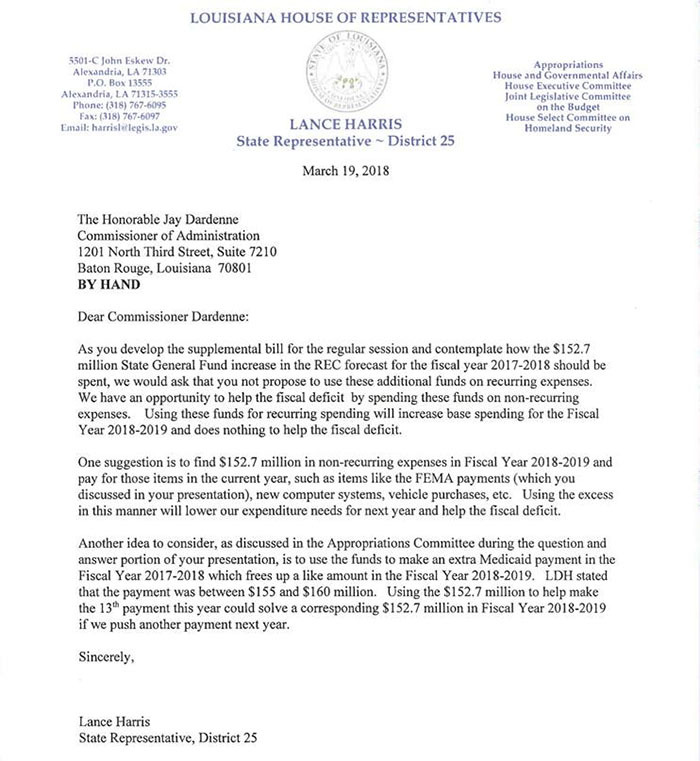 What you’ll hear is that Jindal raided all of Louisiana’s bank accounts to finance the state’s recurring general fund budget, and while there is a bit of truth in that what you never really heard was the question why all of those bank accounts were necessary in the first place. After all, when Louisiana ranks near the bottom in per capita income it doesn’t make a whole lot of sense that the state would be sitting on hundreds of millions of dollars in cash in dedicated funds from overtaxation of its people through the years, and that somehow it was a sin to drain those surpluses to pay the state’s bills rather than impose even more taxes on the public. What would have been better would be to cut the state’s general fund budget even further than Jindal did so as to not need to skim the dedicated funds, and then to address whether the taxes and fees going into the dedicated funds shouldn’t be cut. But there was insufficient political will to do this, so the one-time money filled the gap. In this case, though, we’re talking about one-time money paying for one-time expenses – not recurring expenses. We also don’t know that the $152 million in excess state tax collections won’t materialize in some fashion next year. It might not actually be one-time money at all; instead it might be a new revenue baseline the REC just hasn’t recognized yet. We don’t really know. But again – what we’re talking about is where to put the increase in funds from the revenue figure the governor used to make his initial budget. Put a different way, the debate is over restoring funding, not cutting it. Edwards has already made the cuts; the Legislature’s job is to apply a half-billion dollars or more that it already knows it will have toward its own priorities and those of its constituents. That’s why when you hear all the screaming about how NOW waivers or the TOPS program are going to be eliminated unless your taxes get raised, your answer should be “Bunkum!” or something a little more demonstrative. None of that is going to happen. There will be adjustments to the governor’s budget, and some things might get trimmed here or beefed up there. But what cuts get made will be John Bel Edwards’ cuts. He’s already sent the House a balanced budget, as much of a bluff or dishonest doomsday scenario as he might have called it. The question is going to be what the budget will look like after the Senate, which Edwards controls, gets the House version. We’ve still got some time before that happens.